Four plus miles and over dozens of obstacles later I completed my second Mud Run. For some people I’m sure this would have been a breeze (as I was told by someone I asked to attend in the future….”it wouldn’t be together because I would have to wait for you” – okay tough guy! ), but for me both years it was a personal victory. The first year was 2013. I was heartbroken from having lost my mom earlier that year and then became very sick shortly after. Most of the year was doctors running tests and trying to figure out how to help me. I was actually scheduled for urgent surgery one week after this event. I didn’t know if I should even try to make it through after my doctor said it may not be the best idea to race. I was physically in pain for the entire thing, but had a great team encouraging me and cheering each other on every muddy step of the way. Year two I was much healthier, but still had a little recovering to do. I joined with my team though again; all of us determined to complete another race. Unfortunately, for different reasons, my teammates had to drop out of the race. Injuries, family problems, work schedules and other legitimate obstacles prevented them from racing. I wasn’t sure if I could do it alone, but I joined with two other co-workers (who I barely knew) and forged ahead. Where the first year was an extreme physical challenge the second year was an emotional one. Out of my comfort zone, surrounded by strangers, relying on people I barely knew to help each other through the obstacles and knowing no one would be at the finish line for me this time. 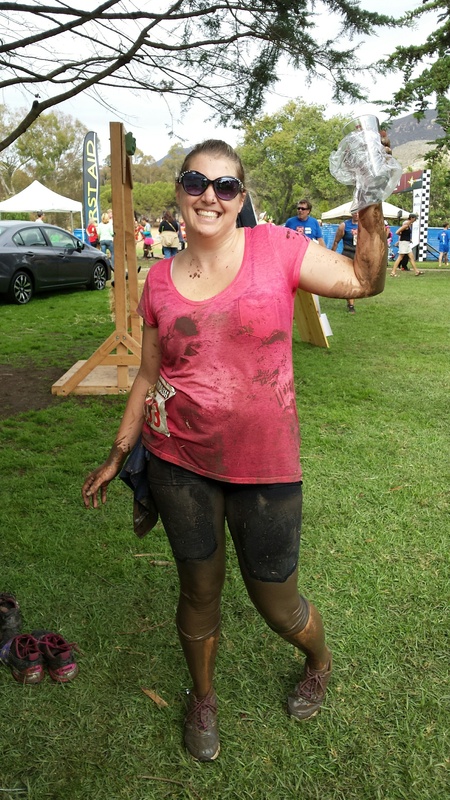 Here I am though, a muddy warrior, in all my glory!